One of my all time favorite comfort foods is macaroni and cheese. In fact, Food Network Magazine editors recently embarked on a cross-country food exploration to find out the most popular comfort foods in America, and it was no surprise to me that mac & cheese made the top ten. This noodle/dairy duo can range from the traffic-cone orange stuff in a box, to grandma’s simple stove-top version made with extra love and heavy cream, to of course the complex gastropub concoctions with their sparing portions and hefty price tags. 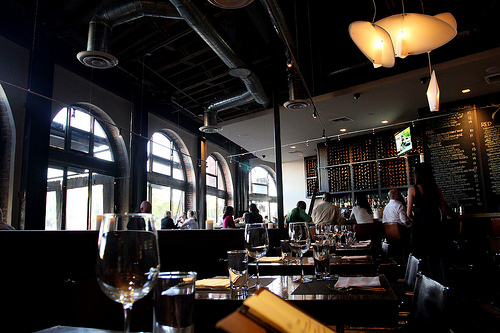 Enter Akasha Restaurant, at 9543 Culver Blvd in Culver City. Located on a block that houses Ford’s Filling Station, Ugo, and just up the street, K-zo Sushi, Akasha holds its own in a neighborhood of fine dining. The dining room is airy, yet somehow intimate. 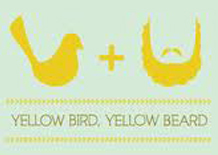 Everything served is organic, hand-made, farm-fresh and sustainable. Even the building materials and take-out containers are green. This new American eatery could easily appear to be more bark than bite to the average passerby, but any press this place has gotten, is well deserved coverage of mouth-watering morsels and a fun atmosphere. On a recent visit with a couple of friends, we ordered several small dishes to share. Everything we ate was cooked to sheer perfection. From the gooey cheese and crispy potato flat bread pizzas, to the seared scallops with corn and bacon, the masala and nectarine chicken… each bite was trip to foreign lands complete with spices and textures that left our table silent except for the ooohs, ahhhhs, and mmmmmms, we all sighed with pleasure. The star of the evening for all of us, was the macaroni and cheese. Ordered as an afterthought, a throw-away, simply filler for the menfolk, we were so wrong to give this dish such little respect by ordering it with waning enthusiasm. 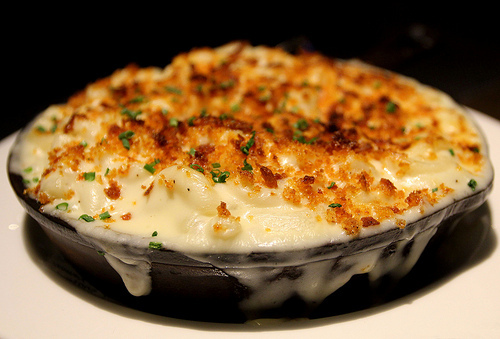 Gruyere and Cheddar cheese are married in a skillet of perfectly cooked noodles baked with breadcrumbs and chives. It’s creamy. It’s light. It’s tangy and sweet at the same time. It’s the power-burst of flavor from the gastropubs of Chicago and New York, yet feels like Grandma’s place without the smoke alarm screaming in the background. All three of us clattered out spoons noisily to in the skillet as we battled for the last bite. I’m not kidding, everything I’ve eaten here is so yummy (I’m salivating as I type this) but if you need a little something extra; had a hard day, lost your dog, or just came off some lame L.A. fast you need the mac and cheese from Akasha. And call me before you go. I’ll meet you there. I went home after this and did nothing but look up gruyere macaroni recipes. I think we should add cherry tomatoes and DO THIS. Sunday dinner, anyone? Yes! Great Idea Farrah! My mouth is watering!